With so many variables to consider when buying and selling a home, the choice of realtor is the most important. 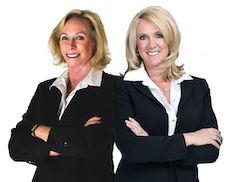 As a repeat and “forever” client, I can testify to the fact that Lori Koentopp and Linda Chain of the Chain/Koentopp Group guarantee a client centric, informed and perceptive experience during what can be an extremely stressful and difficult process. The Chain/Koentopp Group is skilled at their business, operates with utmost integrity and delivers unsurpassed client results. Don’t make a move without them!!! "Linda Chain is one of those individuals you can trust because she follows through with everything; either meeting or exceeding your expectations- from our first meeting until after we closed escrow! We are very happy with the house she found for us! And.... she really knows her stuff!!! I would highly recommend her and her partner!!" "Linda and Lori are the greatest!!! They go above and beyond the normal to help you with any problems that come up!! Linda helped me find just the right property!! "Working with Lori is delightful and effective. She listens, under-promises and over-delivers. A special thanks from me for those market insights of the Vegas market. For as long as I received them they contain good data and useful insights." "Lori is an excellent Realtor that is always looking for the buyers needs and not just to get a quick sell. Understanding and very patient with what I am looking for in a property. I will always return to seek her services because I fully trust her knowledge in real estate." "From the first time we met at Lori's office, I found her to be approachable, professional, and very knowledgeable of the Las Vegas territory and YES, she made my clients VERY, VERY HAPPY!! I would highly recommend her"
Fernando Moretti- Associated Broker at Mulitiple Realty Ltd.
“My wife and I moved to Las Vegas from California 5 years ago and wanted an experienced Real Estate Agent since we were new to the area. She helped us through the difficult process of buying a home and provided excellent guidance, answered every question and explained every form needed to purchase a home. She even helped us find a rental before our new home was finished. Linda made the overall experience very easy for us to relocate. “7 years ago my wife and I decided it was time to purchase a 2nd/Vacation home in Henderson, NV. We started looking at various properties online and in early November we clicked a link to ask a Realtor about a property. The next day we got an e-mail from Linda Chain at ReMax/Benchmark Reality. We scheduled a 2 day visit to the area to look at several houses in the area that interested us and a few that Linda found as well that she thought we might be interested in. Things could not have gone any better from that point. Linda took care of us every step of the way. Every time I e-mailed or called she was available or got back to me promptly. Linda was really on top of things every step of the way and in the end it took a grand total of just 33 days from the first day we walked into the house until escrow closed and we got the keys.